Wirth Research and Eddie Stobart’s strategic partnership began in 2010, culminating in the development of the WR AeroKit™. 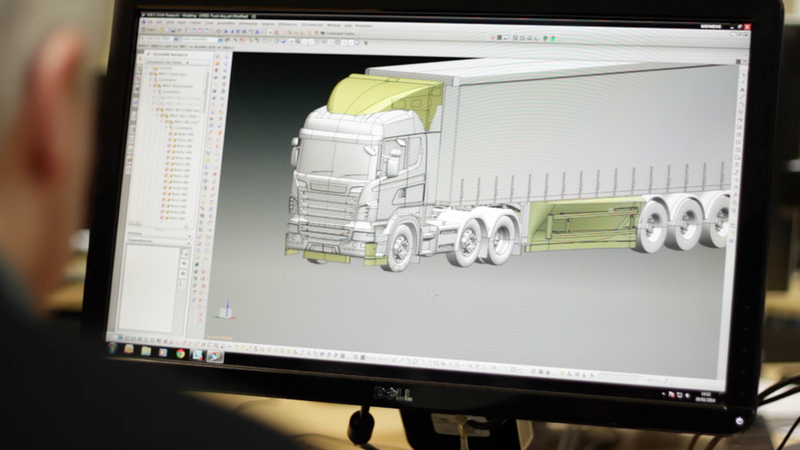 This innovative application of British motorsport technology delivers truly outstanding performance in reducing both the aerodynamic drag and carbon emissions associated with heavy goods vehicles. Eddie Stobart is one of the largest privately owned transport and distribution companies in England, controlling more than 2,500 trucks within a multitude of industries, including retail, consumer goods and special operations. Our aim was to develop a set of aftermarket retrofit components, expertly designed and produced by highly skilled Wirth Research engineers – the WR AeroKit™. Virtual design and engineering work was followed by independent physical testing, at both the Motor Industry Research Association (MIRA) and Millbrook test facilities. This validation work was essential in confirming that our Computational Fluid Dynamics (CFD) results matched observations from physical testing. As a result of the evidence based approach taken to prove the benefits of the WR AeroKit™, Eddie Stobart agreed to a road trial of tractor and trailer kits. This trial involved more than 500,000 kilometres driven using Eddie Stobart vehicles fitted with WR AeroKits™, to demonstrate both that savings would be delivered in the real world, and that the WR AeroKit™ was robust enough to survive day-to-day operations. The WR AeroKit™ was shown to reduce fuel costs by 3.7%* across the full long-haul drive cycle (compared with the existing air-management kit used by Eddie Stobart), with the associated reduction in carbon emissions. *Note this 3.7% is for the full drive cycle; at a steady 55mph, fuel consumption is reduced by 5%.